The animal kingdom is very diverse, but animals share many common characteristics, such as methods of development and reproduction. Animals vary in complexity and are classified based on anatomy, morphology, genetic makeup, and evolutionary history. All animals are eukaryotic, multicellular organisms, and most animals have complex tissue structure with differentiated and specialized tissue. Animals are heterotrophs; they must consume living or dead organisms since they cannot synthesize their own food and can be carnivores, herbivores, omnivores, or parasites. Most animals are motile for at least some stages of their lives, and most animals reproduce sexually. Animal evolution began in the ocean over 600 million years ago with tiny creatures that probably do not resemble any living organism today. Since then, animals have evolved into a highly-diverse kingdom. Although over one million extant (currently living) species of animals have been identified, scientists are continually discovering more species as they explore ecosystems around the world. The number of extant species is estimated to be between 3 and 30 million. But what is an animal? While we can easily identify dogs, birds, fish, spiders, and worms as animals, other organisms, such as corals and sponges, are not as easy to classify. Animals vary in complexity, from sea sponges to crickets to chimpanzees, and scientists are faced with the difficult task of classifying them within a unified system. They must identify traits that are common to all animals as well as traits that can be used to distinguish among related groups of animals. The animal classification system characterizes animals based on their anatomy, morphology, evolutionary history, features of embryological development, and genetic makeup. This classification scheme is constantly developing as new information about species arises. Understanding and classifying the great variety of living species help us better understand how to conserve the diversity of life on earth. Even though members of the animal kingdom are incredibly diverse, most animals share certain features that distinguish them from organisms in other kingdoms. All animals are eukaryotic, multicellular organisms, and almost all animals have a complex tissue structure with differentiated and specialized tissues. Most animals are motile, at least during certain life stages. All animals require a source of food and are, therefore, heterotrophic: ingesting other living or dead organisms. This feature distinguishes them from autotrophic organisms, such as most plants, which synthesize their own nutrients through photosynthesis. As heterotrophs, animals may be carnivores, herbivores, omnivores, or parasites. Most animals reproduce sexually with the offspring passing through a series of developmental stages that establish a fixed body plan. The body plan refers to the morphology of an animal, determined by developmental cues. Heterotrophs: All animals are heterotrophs that derive energy from food. The (a) black bear is an omnivore, eating both plants and animals. The (b) heartworm Dirofilaria immitis is a parasite that derives energy from its hosts. It spends its larval stage in mosquitoes and its adult stage infesting the heart of dogs and other mammals. Animals, besides Parazoa (sponges), are characterized by specialized tissues such as muscle, nerve, connective, and epithelial tissues. Animal cells don’t have cell walls; their cells may be embedded in an extracellular matrix and have unique structures for intercellular communication. Animals have nerve and muscle tissues, which provide coordination and movement; these are not present in plants and fungi. Complex animal bodies demand connective tissues made up of organic and inorganic materials that provide support and structure. Animals are also characterized by epithelial tissues, like the epidermis, which function in secretion and protection. The animal kingdom is divided into Parazoa (sponges), which do not contain true specialized tissues, and Eumetazoa (all other animals), which do contain true specialized tissues. As multicellular organisms, animals differ from plants and fungi because their cells don’t have cell walls; their cells may be embedded in an extracellular matrix (such as bone, skin, or connective tissue); and their cells have unique structures for intercellular communication (such as gap junctions). In addition, animals possess unique tissues, absent in fungi and plants, which allow coordination (nerve tissue) and motility (muscle tissue). Animals are also characterized by specialized connective tissues that provide structural support for cells and organs. This connective tissue constitutes the extracellular surroundings of cells and is made up of organic and inorganic materials. In vertebrates, bone tissue is a type of connective tissue that supports the entire body structure. The complex bodies and activities of vertebrates demand such supportive tissues. Epithelial tissues cover, line, protect, and secrete; these tissues include the epidermis of the integument: the lining of the digestive tract and trachea. They also make up the ducts of the liver and glands of advanced animals. The animal kingdom is divided into Parazoa (sponges) and Eumetazoa (all other animals). As very simple animals, the organisms in group Parazoa (“beside animal”) do not contain true specialized tissues. Although they do possess specialized cells that perform different functions, those cells are not organized into tissues. These organisms are considered animals since they lack the ability to make their own food. Animals with true tissues are in the group Eumetazoa (“true animals”). When we think of animals, we usually think of Eumetazoans, since most animals fall into this category. 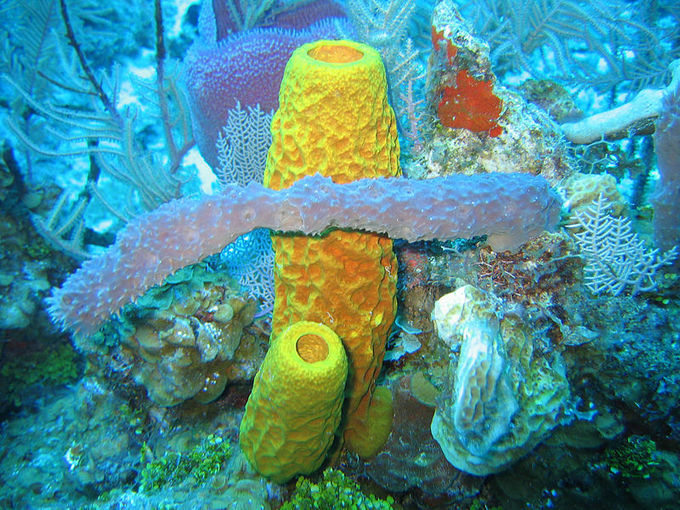 Sponges: Sponges, such as those in the Caribbean Sea, are classified as Parazoans because they are very simple animals that do not contain true specialized tissues. The different types of tissues in true animals are responsible for carrying out specific functions for the organism. This differentiation and specialization of tissues is part of what allows for such incredible animal diversity. For example, the evolution of nerve tissues and muscle tissues has resulted in animals’ unique ability to rapidly sense and respond to changes in their environment. This allows animals to survive in environments where they must compete with other species to meet their nutritional demands. Most animals undergo sexual reproduction and have similar forms of development dictated by Hox genes. Most animals reproduce through sexual reproduction, but some animals are capable of asexual reproduction through parthenogenesis, budding, or fragmentation. Following fertilization, an embryo is formed, and animal tissues organize into organ systems; some animals may also undergo incomplete or complete metamorphosis. Cleavage of the zygote leads to the formation of a blastula, which undergoes further cell division and cellular rearrangement during a process called gastrulation, which leads to the formation of the gastrula. During gastrulation, the digestive cavity and germ layers are formed; these will later develop into certain tissue types, organs, and organ systems during a process called organogenesis. Hox genes are responsible for determining the general body plan, such as the number of body segments of an animal, the number and placement of appendages, and animal head-tail directionality. Hox genes, similar across most animals, can turn on or off other genes by coding transcription factors that control the expression of numerous other genes. Most animals are diploid organisms (their body, or somatic, cells are diploid) with haploid reproductive ( gamete ) cells produced through meiosis. The majority of animals undergo sexual reproduction. This fact distinguishes animals from fungi, protists, and bacteria where asexual reproduction is common or exclusive. However, a few groups, such as cnidarians, flatworms, and roundworms, undergo asexual reproduction, although nearly all of those animals also have a sexual phase to their life cycle. During sexual reproduction, the haploid gametes of the male and female individuals of a species combine in a process called fertilization. Typically, the small, motile male sperm fertilizes the much larger, sessile female egg. This process produces a diploid fertilized egg called a zygote. Some animal species (including sea stars and sea anemones, as well as some insects, reptiles, and fish) are capable of asexual reproduction. The most common forms of asexual reproduction for stationary aquatic animals include budding and fragmentation where part of a parent individual can separate and grow into a new individual. In contrast, a form of asexual reproduction found in certain insects and vertebrates is called parthenogenesis where unfertilized eggs can develop into new offspring. This type of parthenogenesis in insects is called haplodiploidy and results in male offspring. These types of asexual reproduction produce genetically identical offspring, which is disadvantageous from the perspective of evolutionary adaptability because of the potential buildup of deleterious mutations. However, for animals that are limited in their capacity to attract mates, asexual reproduction can ensure genetic propagation. After fertilization, a series of developmental stages occur during which primary germ layers are established and reorganize to form an embryo. During this process, animal tissues begin to specialize and organize into organs and organ systems, determining their future morphology and physiology. 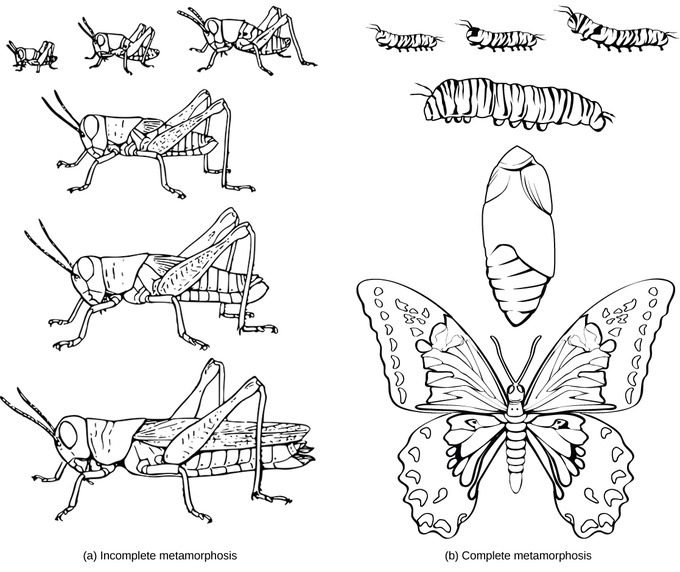 Some animals, such as grasshoppers, undergo incomplete metamorphosis, in which the young resemble the adult. Other animals, such as some insects, undergo complete metamorphosis where individuals enter one or more larval stages that may differ in structure and function from the adult. In complete metamorphosis, the young and the adult may have different diets, limiting competition for food between them. Regardless of whether a species undergoes complete or incomplete metamorphosis, the series of developmental stages of the embryo remains largely the same for most members of the animal kingdom. Incomplete and complete metamorphosis: (a) The grasshopper undergoes incomplete metamorphosis. (b) The butterfly undergoes complete metamorphosis. The process of animal development begins with the cleavage, or series of mitotic cell divisions, of the zygote. Three cell divisions transform the single-celled zygote into an eight-celled structure. After further cell division and rearrangement of existing cells, a 6–32-celled hollow structure called a blastula is formed. Next, the blastula undergoes further cell division and cellular rearrangement during a process called gastrulation. This leads to the formation of the next developmental stage, the gastrula, in which the future digestive cavity is formed. Different cell layers (called germ layers) are formed during gastrulation. These germ layers are programed to develop into certain tissue types, organs, and organ systems during a process called organogenesis. Embryonic development: During embryonic development, the zygote undergoes a series of mitotic cell divisions, or cleavages, to form an eight-cell stage, then a hollow blastula. During a process called gastrulation, the blastula folds inward to form a cavity in the gastrula. Since the early 19th century, scientists have observed that many animals, from the very simple to the complex, shared similar embryonic morphology and development. Surprisingly, a human embryo and a frog embryo, at a certain stage of embryonic development, appear remarkably similar. For a long time, scientists did not understand why so many animal species looked similar during embryonic development, but were very different as adults. Near the end of the 20th century, a particular class of genes that dictate developmental direction was discovered. These genes that determine animal structure are called “homeotic genes.” They contain DNA sequences called homeoboxes, with specific sequences referred to as Hox genes. This family of genes is responsible for determining the general body plan: the number of body segments of an animal, the number and placement of appendages, and animal head-tail directionality. The first Hox genes to be sequenced were those from the fruit fly (Drosophila melanogaster). A single Hox mutation in the fruit fly can result in an extra pair of wings or even appendages growing from the “wrong” body part. There are many genes that play roles in the morphological development of an animal, but Hox genes are so powerful because they can turn on or off large numbers of other genes. Hox genes do this by coding transcription factors that control the expression of numerous other genes. Hox genes are homologous in the animal kingdom: the genetic sequences and their positions on chromosomes are remarkably similar across most animals (e.g., worms, flies, mice, humans) because of their presence in a common ancestor. Hox genes have undergone at least two duplication events during animal evolution: the additional genes allowed more complex body types to evolve. Hox genes: Hox genes are highly-conserved genes encoding transcription factors that determine the course of embryonic development in animals. In vertebrates, the genes have been duplicated into four clusters: Hox-A, Hox-B, Hox-C, and Hox-D. Genes within these clusters are expressed in certain body segments at certain stages of development. Shown here is the homology between Hox genes in mice and humans. 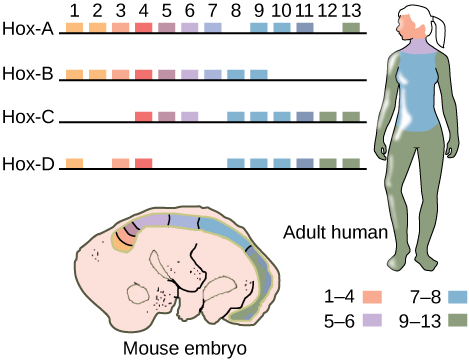 Note how Hox gene expression, as indicated with orange, pink, blue, and green shading, occurs in the same body segments in both the mouse and the human.